The lines are mounted on strips of contact paper or tape and then transferred to the cross. 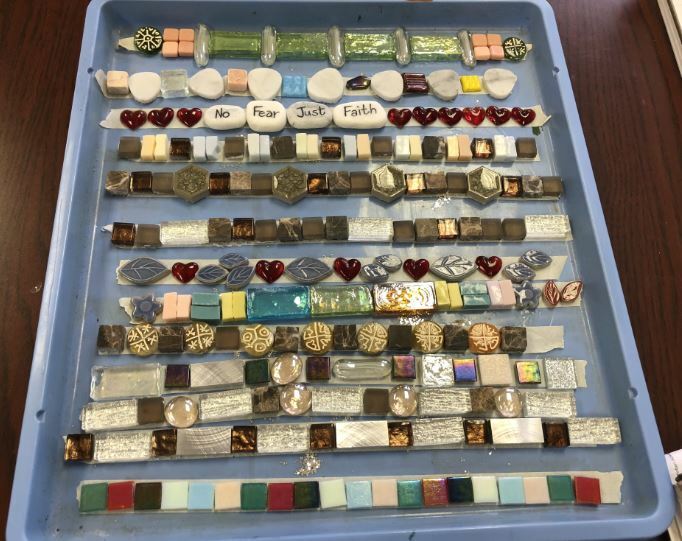 Students create the mosaic lines on strips, which are then transferred to the cross. Completed mosaic lines on tape. 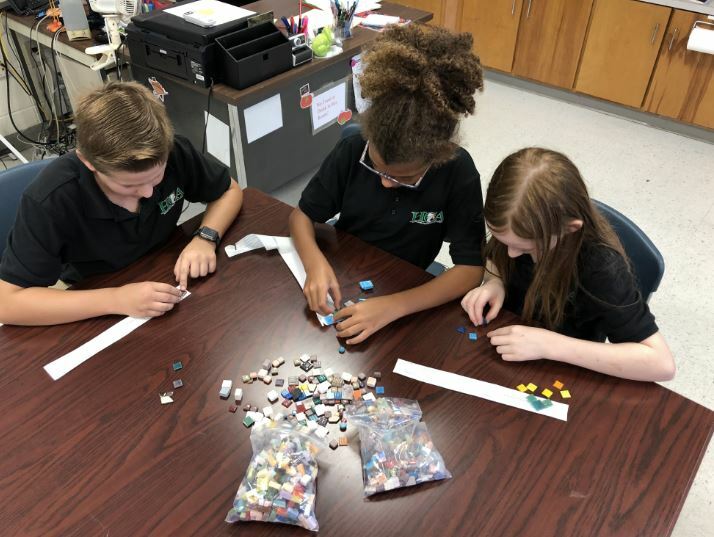 These students are using materials from the mosaic salvage assortment to create their designs. Working on mounting the cross backer material. Maddie Pitts was a creative soul that just recently lost her battle with cancer at the age of 13. She loved art and all that was beautiful. Her favorite colors were pink and teal and she inspired both young and old to embrace life and the Lord that she loved. Our students loved her and felt as if she was part of our family. They expressed a desire to make a garden to remember her and to honor her life! The Key club started a garden a year ago and Maddie was excited about the idea that something could bring beauty that would last maybe longer than her life! We decided at the beginning of this school year that we would move the garden to a spot that would be seen more and had better soil and access to water. A pink bench was donated and plants were put around the edges to grow and bloom. 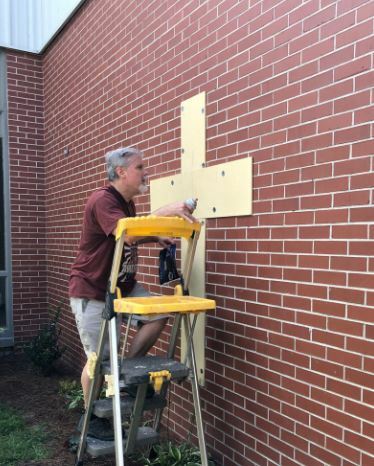 We are installing a mosaic cross in center of the back brick wall that includes mosaic art tiles placed there by every student. This is a school-wide art project to bring honor to Maddie and remind us all of how much we loved her and how much she loved us. Thanks to your tiles, our students continue to make one inch lines on contact paper strips to be transferred on to the cross. Dan Wells constructed the cross out of weatherproof board to mount the mosaic tiles on. Cannot wait to get the students to assemble the lines. 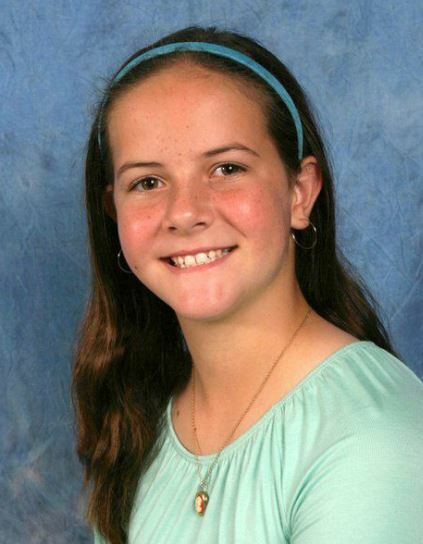 Thank you for sharing Maddie’s Memorial Cross project and her story! 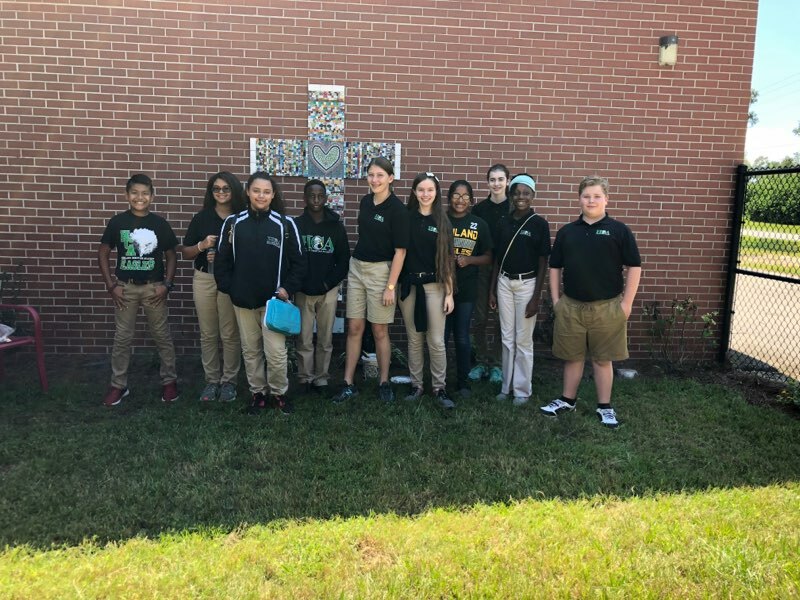 The cross dedication was on Oct. 8th, 2018. 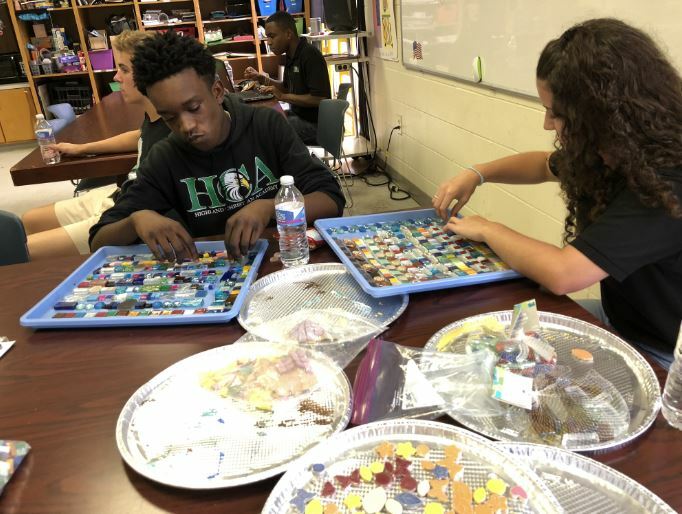 Mosaic art supply made this project incredibly beautiful and allowed our students to express their creativity in an individual way. Thank you again for all your help! As Maddie’s mom, this project has been so beautiful and meaningful to our family and friends at HCA. Art allows the hands to say what the heart feels. Maddie’s friends took this chance to honor her and comfort their own grief in a beautiful tribute. Thank you for helping to facilitate this project for all to enjoy and remember our girl. 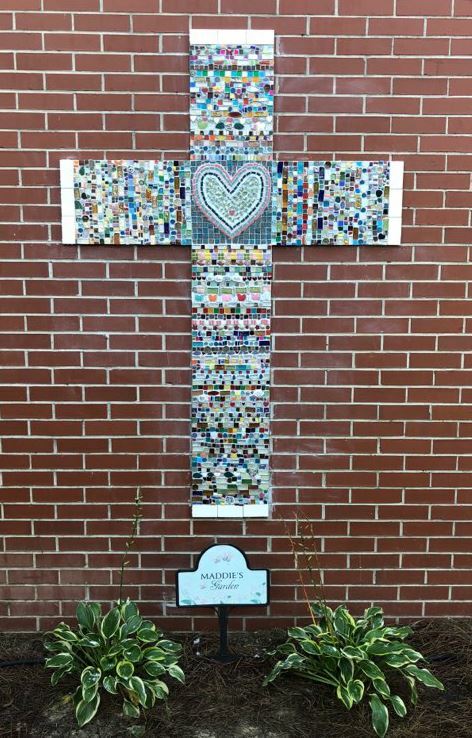 I stopped by this website to read up on outdoor mosaics and found this article about Maddie’s cross. My heartfelt sympathy to Maddie’s loves ones. 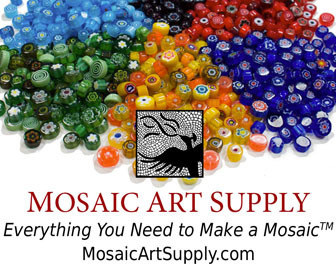 The mosaic Cross is beautiful, and the story behind it and the intent is touching and lovely. God’s blessings to all. Your precious Maddie is well.